Her sainted spirit most delights to trace." Among her other munificent acts, was a monument to the memory of our poet, on which she caused it to be engraven that she had been his pupil; a circumstance which she seems to have remembered with delight, at the distance of more than half a century after his decease. At the death of Spenser, Daniel, according to Anthony Wood, was appointed poet-lanreat to tiuceu Elizabeth; but Mr. Malone, whose researches lead to more decisive accuracy, considers him only as a volunteer laureat, like Jonson, Dekker, and others who furnished the court with masks and pageants. In king James’s reign he was made gentleman extraordinary, and afterwards one of the grooms of the privy-chamber to the queen consort, who took great delight in his conversation and writings. Some of la’s | biographers attribute this promotion to the interest of his brother-in-law, Florio, the Italian lexicographer, but it is perhaps more probable that he owed it to the Pembroke family. 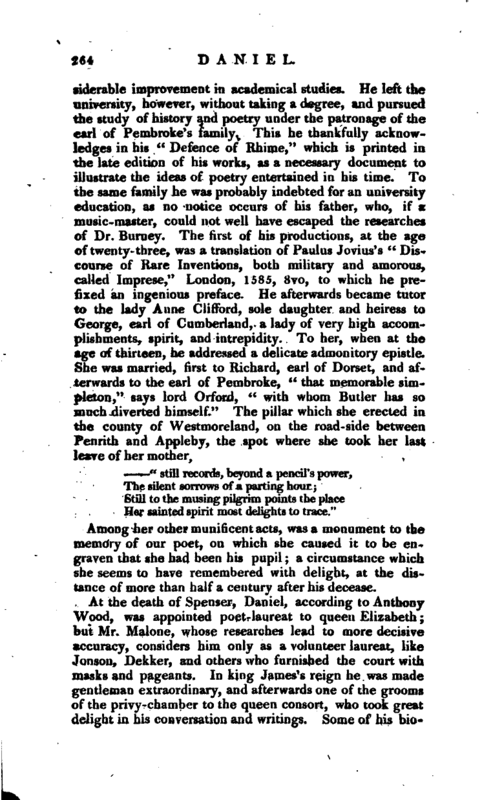 Mrs. Cooper, in her Muses’ Library, observes, that in the introduction to his poem on the civil wars, he acknowledges the friendship of one of the noble family of Mountjoy; and this, adds our female critic, is the more grateful and sincere, as it was published after the death of his benefactor. He now rented a small house and garden in Old-street, in the parish of St. Luke’s, London, where he composed most of his dramatic pieces, and enjoyed the friendship of Shakspeare, Marlowe, and Chapman, as well as of many persons of rank; but he appears to have been dissatisfied with the opinions entertained of his poetical talents; and towards the end of his life retired to a farm, which he had at Beckington, near Philips-Norton, in Somersetshire, and where, after some time devoted to study and contemplation, he died, and was buried Oct. 14, 1619. He had been married to his wife Justina, several years, but left no issue. 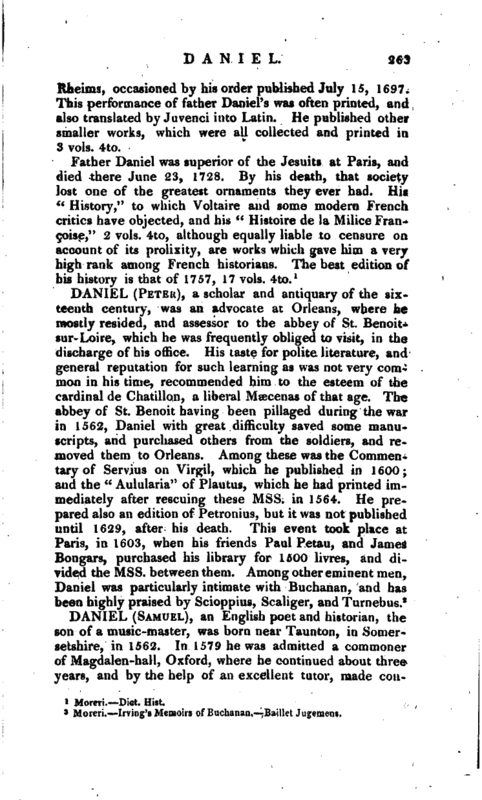 Of Daniel’s personal history we know little, but the inferences to be drawn from his works are highly favourable. He is much praised by his contemporaries, although chiefly with a view to his genius. 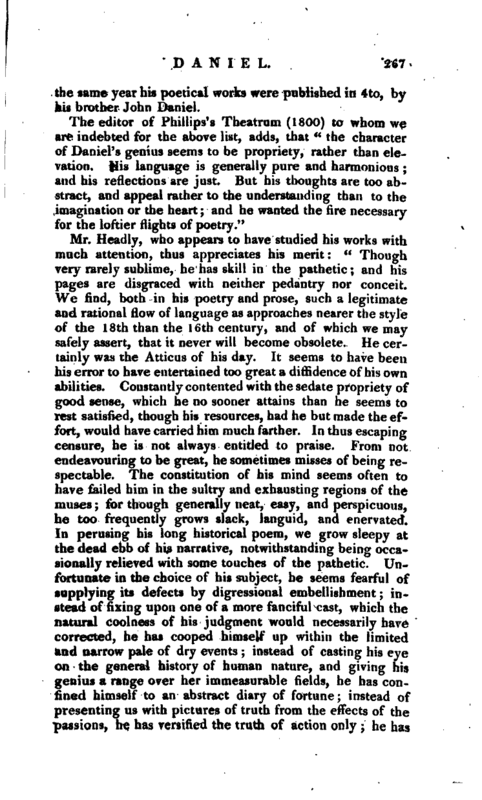 Edmund Bolton, in a criticism on the style of our poets before 1600, says, “The works of Samuel Daniel containe somewhat aflat, but yet withal a very pure and copious English, and words as warrantable as any man’s, and fitter perhaps for prose than measure;” and Gabriel Harvey, in his “Foure Letters and Certaine Sonnets,” cordially recommends him, with others, for his studious endeavours to enrich and polish his native tongue. His works consist of: 1. “The Complaint of Rosamond,” Lond. 1594, 1598, 1611, and 1623, 4to. 2. Various “Sonnets” to Delia. 3. 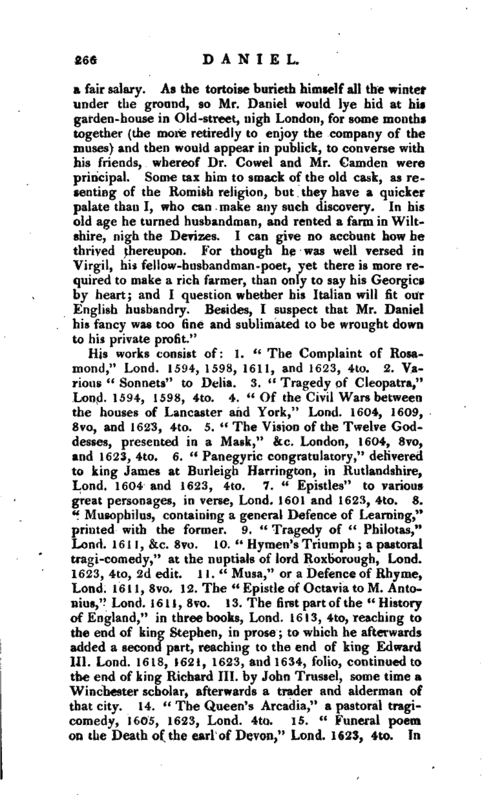 “Tragedy of Cleopatra,” Lond. 1594, 1598, 4to. 4. “Of the” Civil Wars between the houses of Lancaster and York,“Lond. 1604, 1609, 8vo, and 1623, 4to. 5.” The Vision of the Twelve Goddesses, presented in a Mask,“&c. London, 1604, 8vo, and 1623, 4to. 6.” Panegyric congratulatory,“delivered to king James at Burleigh Harrington, in Rutlandshire, Lond. 1604 and 1623, 4to. 7.” Epistles“to various great personages, in verse, Lond. 1601 and 1623, 4to. 8.” Musophilus, containing a general Defence of Learning,“printed with the former. 9.” Tragedy of “Philotas,” Lond. 1611, &c. 8vo. 10. “Hymen’s Triumph; a pastoral tragi-comedy,” at the nuptials of lord Roxborough, Lond. 1623, 4to, 2d edit. 11.“Musa,” or a Defence of Rhyme, Lond. 1611, 8vo. 12. The “Epistle of Octavia to M. Antoiiius,” Lond. 1611, 8vo. 13. The first part of the “History of England,” in three books, Lond. 1613, 4to, reaching to the end of king Stephen, in prose; to which he afterwards added a second part, reaching to the end of king Edward III. Lond. 1618, 1621, 1623, and 1634, folio, continued to the end of king Richard III. by John Trussel, some time a Winchester scholar, afterwards a trader and alderman of that city. 14. “The Queen’s Arcadia,” a pastoral tragicomedy, 1605, 1623, Lond. 4to. 15. 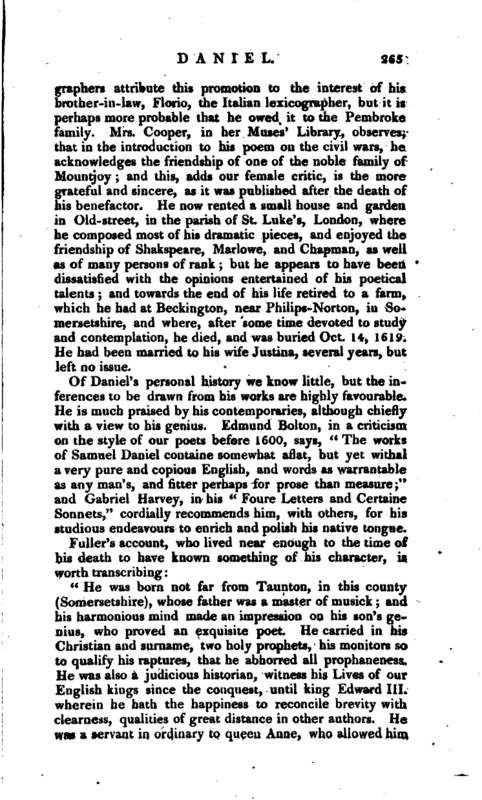 “Funeral poem on the Death of the earl of Devon,” Lond. 1623, 4to. 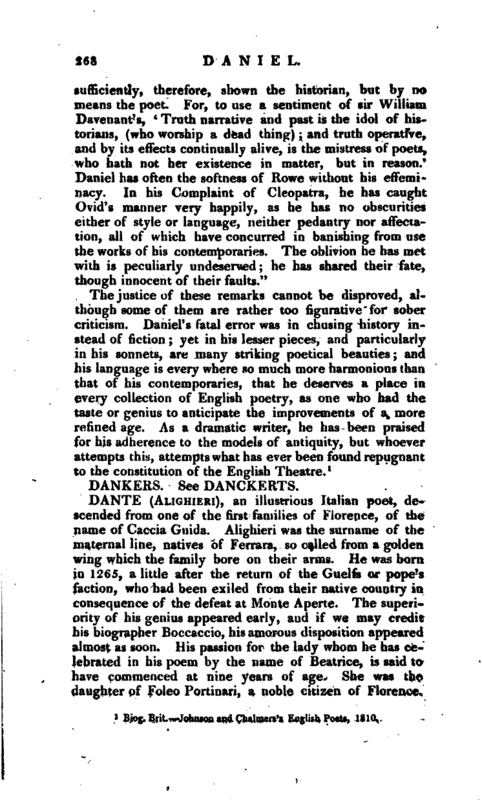 In | the same year his poetical works were published in 4to, by his brother John Daniel. 1 Biog. Brit.-^ Johnson and Chalmers’s English Poets, 1810.